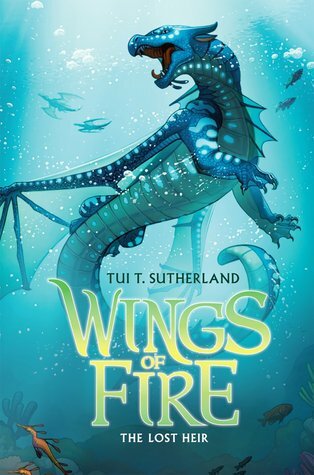 The WINGS OF FIRE saga continues with a thrilling underwater adventure -- and a mystery that will change everything! But Tsunami’s triumphant return doesn’t go quite the way she’d imagined. Queen Coral welcomes her with open wings, but a mysterious assassin has been killing off the queen's heirs for years, and Tsunami may be the next target. The dragonets came to the SeaWings for protection, but this ocean hides secrets, betrayal—and perhaps even death. Tsunami is finally going home to the kingdom of the sea. But she doesn't know what mysterious things have been happening, and Queen Coral, Tsunami's mother has had her daughters mysteriously destroyed in their eggs. Tsunami is determined to save the last surviving egg and discovers secrets even her mother didn't know of. I like the mysteries, they are very strange and can be a bit spooky at times, but also a story filled with magic and fun. I can't wait for the next book, I just finished Escaping Peril. I really want a book about Kinkajou. I think that this book is a bit scary and readers should be prepared. Also, beware of enchanted statues. Really after she leaves you with a Bah Bah Buuuuumm I am not sure what else I can say, haha. A few things...the world building for The Kingdom of The Sea is fantastic. 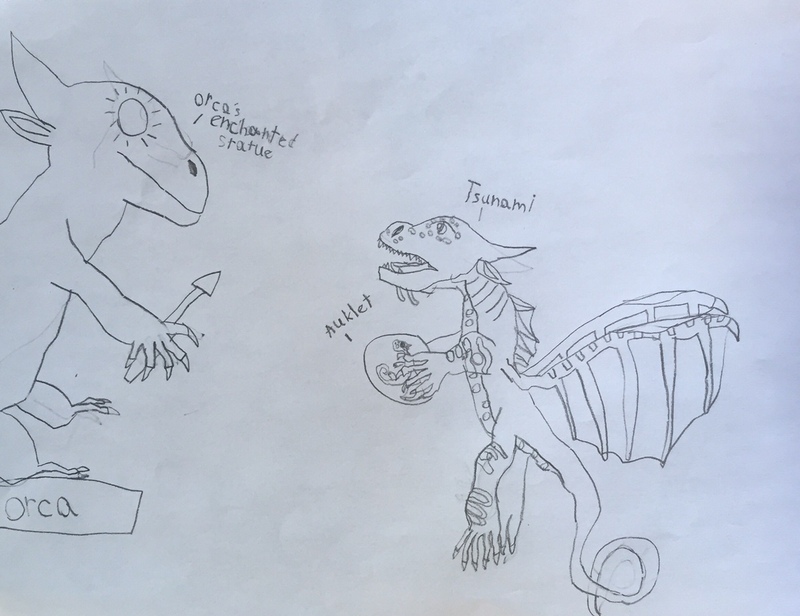 Anytime a young reader can fully visualize the world they are reading about and get excited about it you know you have a winner. One of my favorite things about this series in fact is it's ease at pulling in reluctant readers and turning them into book-a-holics. 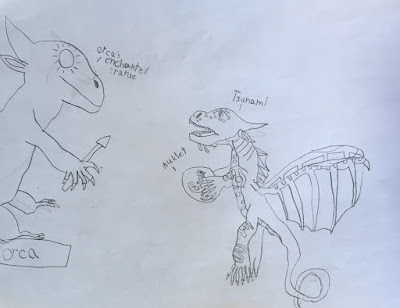 I like that in this series each book gives us the point of view of a different Dragonet, but continues with the main original characters each fighting their own battles and working together to discover their world and find their way. As with the first book there are some moments that may be more difficult for sensitive readers, particularly one moment that involves Tsunami's father. There are not too many scary moments so don't let that keep you from getting this book, but you might have a moment where your reader needs to talk to you about what is happening. Of course if they are anything like my MG reader, they will want to talk your ear off about all these books regardless of any scary moments, these are books I find that readers just HAVE to share! This is a great book for Middle Grade readers, particularly reluctant readers. The books are both fun, with sarcastic and witty characters, they are balanced with poignant moments and battles. I do recommend that they be read in order, you will be missing out on important facts by reading them out of order. A great addition to any teachers classroom library! Okay, I know what you’re thinking. Tui? What kind of name is that? Is it short for something? Nope. Among the many great things to come out of New Zealand (the Lord of the Rings movies, cats that paint, my mom) is a bird called the tui—not as well known as the kiwi, but a heck of a lot noisier! I graduated from Williams College in ’98 and I currently live in Boston with my husband, my perfect new baby, and my adorable yoodle Sunshine (what’s a yoodle? A puppy that’s three-quarters poodle and one-quarter Yorkshire terrier, of course!). Much to my parents’ relief, I abandoned my theatrical aspirations after college for the far more stable and lucrative career of fiction writing. My first two official books were beginning readers, part of Grosset & Dunlap’s “First Friends” series for kids learning to read. MEET MO AND ELLA is tough to find now, but FUN WITH MO AND ELLA should still be out there somewhere. My first novel for teenagers was THIS MUST BE LOVE, which retells Shakespeare’s play A Midsummer Night’s Dream in a modern-day high school, from the POV of the two heroines, Hermia and Helena. And now I'm writing in a new project called SEEKERS! 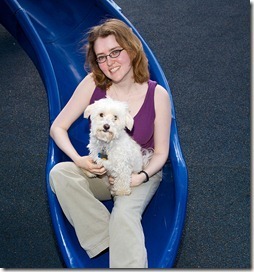 It's a children's book series that I'm writing with Erin Hunter. Check out my blog to find out more! Oh, thank you so much, that is very kind of you to say and exactly what I want to do, give honest conversational type reviews. The Wings of Fire series is an excellent one and luckily there are more books to come! I hope that you enjoy them!